Treasure the colder weather but only after you have pieces that will keep you warm. 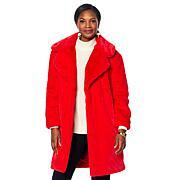 This coat gives you a cozy layer and makes it so you can look regal, day and night. This coat is beautiful and chic. You can wear it with something dressy or casual. The hood is pretty big though. I ordered a medium. I usually wear M/L (size 10 in dresses and size 8 in pants) my shoulders and arms are larger than the normal woman due to weight lifting. It fit me perfect with regular sweaters but it was a bit tight wearing thick sweaters. I could have probably went up a size but then it would have been too big for my liking because I like things a bit fitted. I'm 5'4. 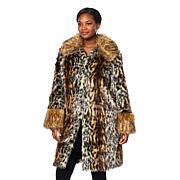 Love this coat, its soft, beautiful, comfortable, I get ton's of compliments of it, and best of allits very warm, the hood is great size. Great looking jacket! Got to wear it out for New Years Eve. I have same style in real mink in blue iris - only I know will know which one is imposter. Great quality!! Can't say enough about this coat! So rich looking, super soft and glistens with its rich navy color in the sun! Constantly getting compliments on it when I wear to work! Perfect on a cold NH day and night while walking my dogs too! Roomy in my normal size so don't size up. 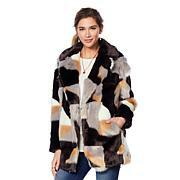 I can wear heavy sweaters under and zipper never catches in faux fur. Please make in other colors or more jackets similar to this one! Would definitely buy more colors! This navy is perfect! Easy glam is Adrienne Landau’s motto. The New York-based designer’s fun and fabulous lifestyle brand brings opulence and luxury to all your faux fur fashion and home décor essentials. From the boardroom to the bar and even the bedroom, these unique and versatile pieces are perfect for the woman who wants to look and feel like a million dollars ... without spending a million dollars. Remind me about A by Adrienne Landau upcoming shows.